This recipe was adapted from Easy Hoisin Shrimp from Gimme Some Oven. It’s true what they say, we eat with our eyes first, that’s why I knew I had to give this recipe a try when I saw it on Gimme Some Oven. However, because the original recipe uses shrimp, I had to make a few changes~ I don’t eat animal flesh and one other very important reason~ I have a shellfish allergy. Tofu replaced the shrimp, coconut aminos was used instead of soy sauce, I added a bit of hot chili sauce for spice, sesame oil and cilantro, I used because I absolutely love their flavors together. 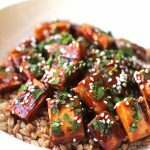 I love that this recipe is so versatile, the original recipe uses shrimp, I used tofu and I’m sure you could use chicken, salmon or beef. Ali, over at Gimme Some Oven, served her dish up on a bed of rice, while I served my tofu on a bed of farro, because it’s what I had on hand. It would also be great on a bed of veggies or noodles. If you try this recipe, let me know how you serve it, be sure to tag it #thewholeserving on Instagram or Twitter, I’d love to see! 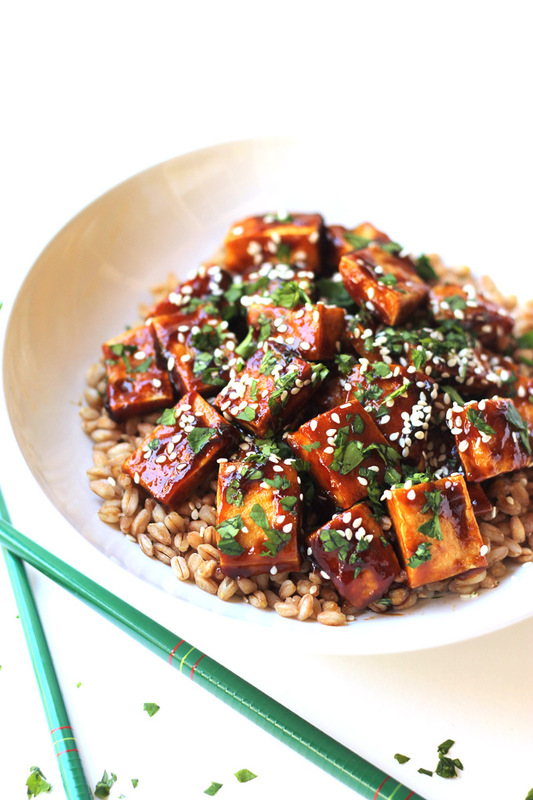 Combine hoisin sauce, rice wine vinegar, coconut aminos, hot chili paste and sesame oil in a small bowl. Mix until well combined and set aside. Heat olive oil in a large skillet over medium high heat. Add half of the tofu and saute for 2 to 3 minutes, or until tofu starts to brown. Transfer browned tofu to a plate lined with paper towel to drain. Repeat with remaining tofu. Add tofu back to skillet along with the hoisin mixture, tossing to coat tofu evenly. Saute another 2 to 3 minutes, making sure tofu is evenly coated and sauce is throughly heated. Remove from heat and serve over farro, rice, veggies, noodles, whatever you choose. Sprinkle on sesame seeds and cilantro. Thank you, please let me know how it works for you. Love this! 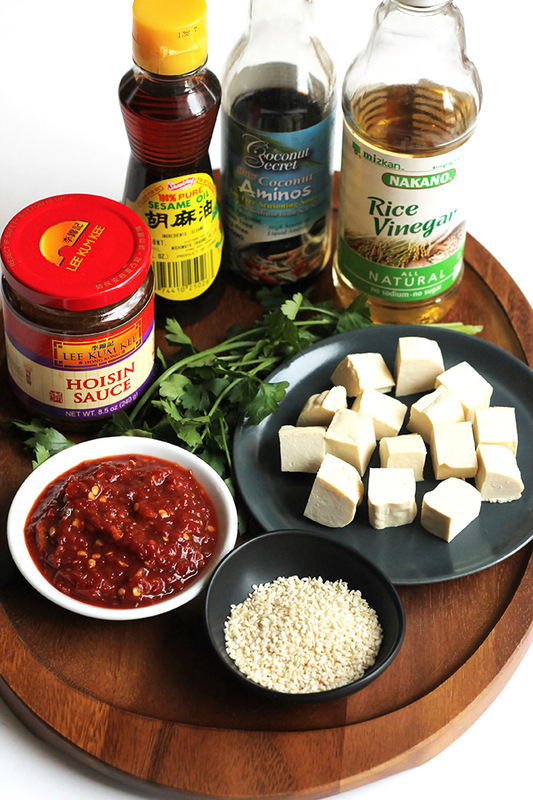 I haven’t had tofu in a while–can’t wait to try making this! Thanks, I hope you like it as much as I do! Oh yum – this looks so delicious and saucy! 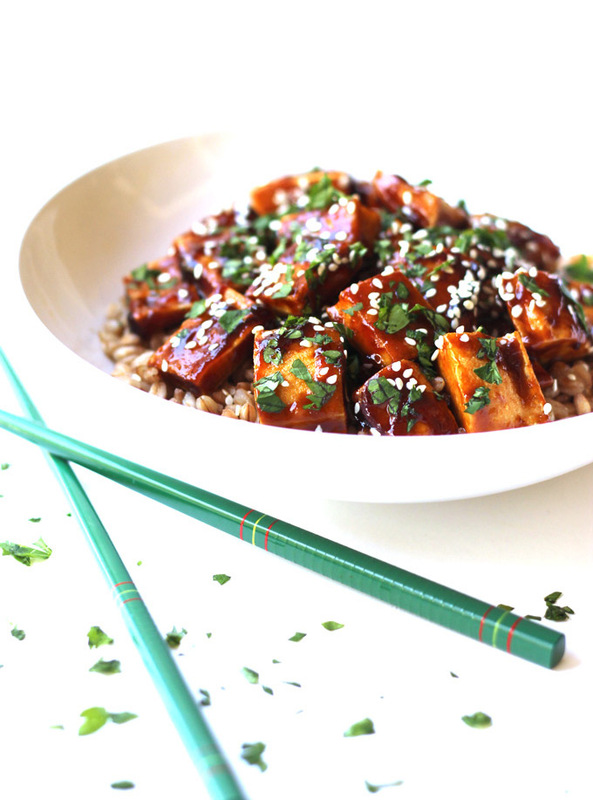 Love a good tofu stir fry.. this dish will make an excellent dinner for myself and my vegetarian family tonight. Thanks for the delicious recipe! You are so welcome, I’m glad you like it. I hope your family enjoys it. I hope you like it, I stopped by your site and I like the Cuban Beer-Infused Black Beans. This looks absolutely incredible, Celeste! Saw this over on Pinterest and the photos are beautiful! 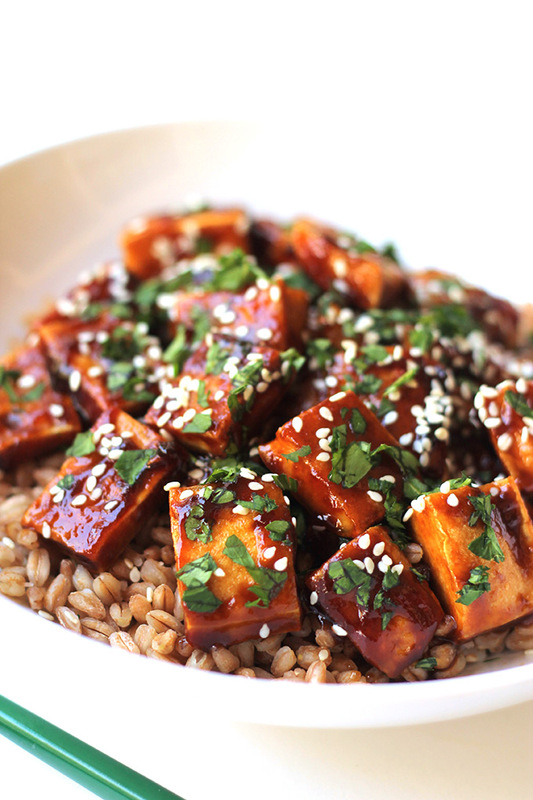 Love this tofu dish! Thanks for sharing! I need to go buy a big bottle I love using it, but there’s not much in the bottle. Thanks for stopping by, and I’m glad you like it.